I suppose I don't have to name them, but I can... so I did. This one I've named Albert. 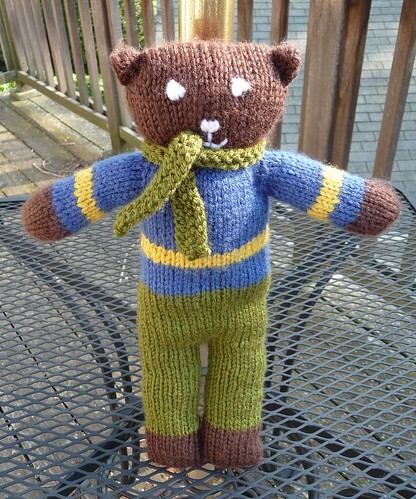 He was knit in the round starting with the head and using Judy Becker's magic cast on to create a no seam start. I knitted down a bit leaving openings for the arms and added the face (thank you Jan for that suggestion!). I continued down to the crotch where one leg is put on waste yarn and the other is knitted down to the end of the paw. I added both arms finishing them with the last 2 rounds k2tog then pulling the yarn through the remaining stitches for the rounded paw look. I then stuffed him before picking up for the 2nd leg. After knitting about 2/3 of the second leg I stuffed him some more down into the last leg as I knitted it and finished the feet with a Kitchener stitch after some more stuffing. There will be a gap in the crotch that has to be seemed up, and it's a good spot to add additional stuffing if need be. Knit a scarf and attach it and sew down the ears. Wallah! If you want the pattern as it is originally posted knitted flat, folded and seemed up you can get it at DIY Knitty Gritty.